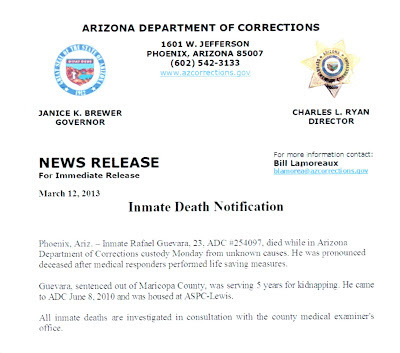 Arizona Prison Watch: ASPC-Lewis Death in Custody: Rafael Guevara, 23. It seems like an awful lot of prisoners are dying young under Jan Brewer's administration; this fellow was only 23. Usually when I see "unknown causes" with a prisoner that age, it means he likely died of a drug overdose - occasionally it's something like an aneurysm. 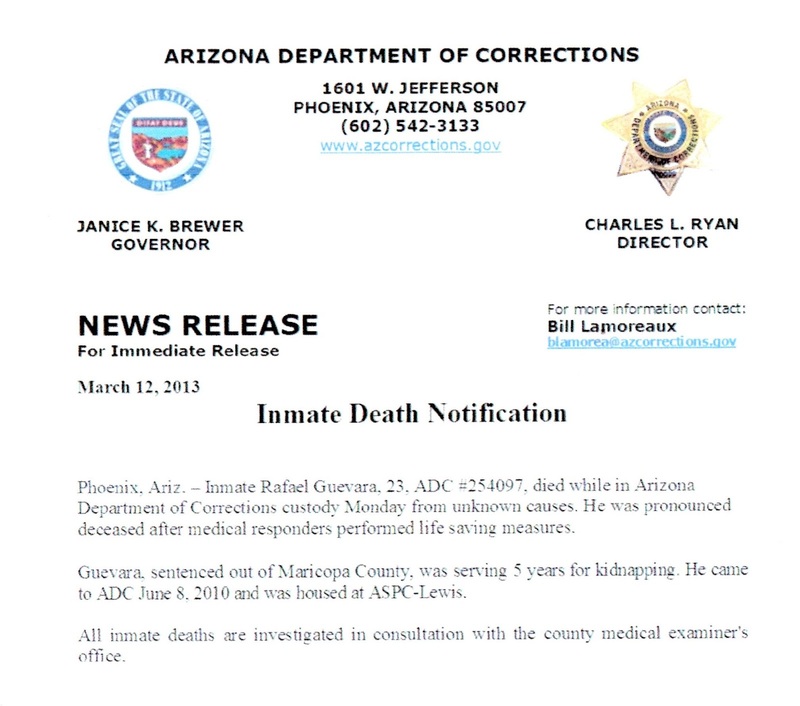 AZ DOC staff already have an idea of what happened from their investigation, I suspect, but they won't have pathology results for awhile, at which time they won't be putting out a new press release - not unless they know they'll be liable for something and they want to make their victim (the dead prisoner) look especially unsympathetic. 40-foot sidewalk chalk memorial for Jan Brewer's dead prisoners. That said, our condolences to Rafael's family, whatever the cause of his passing. If anyone is in touch with them, please pass my contact info along (Peggy Plews at arizonaprisonwtatch@gmail.com or 480-580-6807) and let them know I'm here to help with information and support however I can. I've seen too many other families go through this - they've been organizing, though, and they're here and willing to be of help, too. Also, if anyone else out there knows about what happened to Rafael, please let me know so I can stay on top of what's happening inside and pass relevant info along to his family or their attorneys. 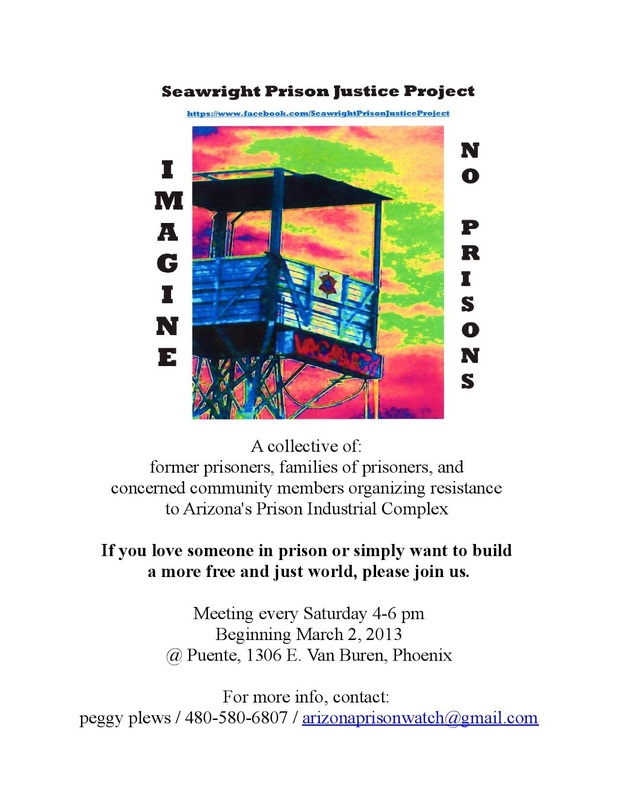 They need to know about the class action lawsuit, Parsons v Ryan; the riots and the proliferation of drugs, gangs and violence in AZ's prisons these days; the lack of substance abuse treatment behind bars; and the doubling of the suicide and homicide rates under the current directorship of Chuck Ryan. All of those things together suggest that the level of deliberate indifference to prisoners' lives is institutional and comes from the top, not from just a few bad apples in brown with badges, as the state wanted us to believe when Marcia Powell died in that cage four years ago. I'm also open to feedback from you, Bill Lamoreaux, if you or Chuck think I'm representing the ADC unfairly and your propaganda machine can't keep up. You know where to find me. Finally, if you have a friend or loved one in jail or prison and need help or support dealing with the system, come find the Seawright Prison Justice Project every Saturday from 4 - 6pm at PUENTE (1306 E. Van Buren, PHX).